But until recently, the promise that location will revolutionize marketing has mostly been hype. Beyond using zip codes to personalize email campaigns and beacons to enhance the retail shopping experience, most marketers haven’t really figured out how to leverage location data to engage customers and drive sales. Until now. As smartphones become more sophisticated, wearable devices grow in popularity, and consumers get more comfortable sharing their location, forward-thinking brands are finding creative ways to use geo-targeting and other location-based tactics. Will 2016 be the year marketers finally make location a key part of their mobile content strategy? What’s driving this trend? And which brands are leading the charge? Thanks to mobile technology, there are more ways than ever to capture real-time location data and communicate with customers on the fly. Sixty-eight percent of adults in the US now own smartphones. By 2019, worldwide shipments of wearable devices are expected to reach 173.4 million units. And MIT recently received $317 million from federal and state governments, as well as industry partners, to found the Advanced Functional Fabrics of America. This independent nonprofit will create fabrics and fibers with technological capabilities, including “smart” clothing. The more ways mobile users have to connect to the Internet, the more ways brands have to connect with consumers—to gather their location data and communicate with them accordingly. Of course, the trick is getting consumers to actually share that information. Just because people can easily engage in location-based marketing campaigns doesn’t mean they will. Similarly, Boxever, a customer intelligence firm for the travel industry, reports that while 61 percent of consumers want offers targeted to “where they are and what they are doing,” 62 percent don’t want brands actually tracking their location. The good news for marketers? Many consumers will change their tune if it benefits them to do so. 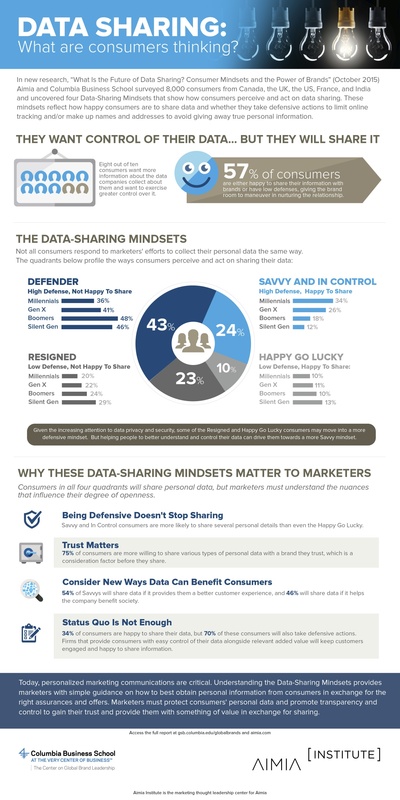 Researchers also separated survey respondents into four different mindsets, depending on their willingness to share and how much control they want over how their data is used. As these studies prove, monetary rewards are particularly persuasive, but discounts aren’t the only value brands have to offer in exchange for location data. They can also offer relevant content that’s data dependent. Bottom line: Make it clear what users get out of sharing their location, and they’re far more likely to do so. Then your brand has the opportunity to engage them in innovative, hyper-relevant ways like the following companies are doing. Location-based marketing finally got interesting over the past couple years with the introduction of beacons—bluetooth-enabled devices that communicate with passersby who’ve installed a business’s mobile app. Airports and sporting venues, for instance, are using them for indoor mapping and other customer services. But retailers have made the biggest inroads, with companies like Macy’s, Lord & Taylor, and Target using beacons to greet customers and send personalized discount offers. Last year, Whole Foods partnered with the location-based marketing firm Thinknear to boost its mobile content strategy and woo potential customers away from competitors. By placing geofences around various Whole Foods locations, the health food market targeted ads and special offers to mobile users who passed by. The company also placed geofences near competitors’ stores, incentivizing shoppers to travel a bit further in exchange for better deals at Whole Foods (a tactic known as “geo-conquesting”). The result: The campaign yielded a 4.69 percent post-click conversion rate—more than three times the national average. Merchants like New York ice cream store Van Leeuwen are capitalizing on this desire by offering mobile payment options capable of tracking location. Van Leeuwen customers can now place and pay for their sweet treats using PayPal’s mobile app (that’s value for the customer). Then in the future, the app uses the geolocation data it captured to detect when customers are near a Van Leeuwen’s store and entice them back with special offers (that’s value for the company). The result: Van Leeuwen now generates 5 percent of revenue from the payment app. To drive in-store foot traffic and sales, clothing Charlotte Russe partnered with proximity retail platform GPShopper to add a location-based element to its “Appy Hour” promotions, which offer mobile users daily discounts. Tapping into the GPShopper’s geofences enables Charlotte Russe to send push notifications to customers who are already near a store and thus more likely to make a purchase, and to compel new customers to download the app. The result: App downloads increased by 295 percent during a 30-during period. In-app revenue grew by 321 percent, and in-store sales ended up being 3.7 times greater than in-app sales. Discounts aren’t the only way to get mobile users to share their location. Providing useful information is also a great way to engage users and endear them to your brand. And as GasBuddy has proven, you don’t even have to generate all the content. GasBuddy is a popular mobile app designed to help users find the best gas prices in their local areas using crowdsourced data. Users share their location and report what they’re paying for fuel. In exchange, they can see gas stations where their fellow users have found better deals. The result: The GasBuddy app has been downloaded more than 52 million times, and consumers help one another save billions per year. If your brand doesn’t have sufficient location data for customers, why not partner with a company that does? This is what Quirky and GE did to promote its new mobile-controlled air conditioner. As part of a location-based marketing campaign in Boston and New York, these manufacturers teamed up with weather alert system Poncho, which sends its users daily forecasts via email and text messages. Whenever the temperature in these areas rose above 75 degrees, the weather alerts included promotional content about the air conditioners, with a link to buy. The results: Quirky and GE haven’t released performance data for the campaign, but Poncho claims to have open rates of 60 percent on emails and nearly 100 percent on texts. So at the very least, plenty of targeted customers saw the promotional content. Despite the in-roads these brands have made, marketers have only just begun to scratch the surface of what location data could offer in terms of mobile content strategy. At this point, the focus has been more on creative strategies rather than creative content. But as brands find their stride in this domain and convince more consumers to trust them with location data, perhaps we’ll soon see compelling location-based brand storytelling as well. For more ways to improve your mobile content strategy, become a Content Standard Insider.